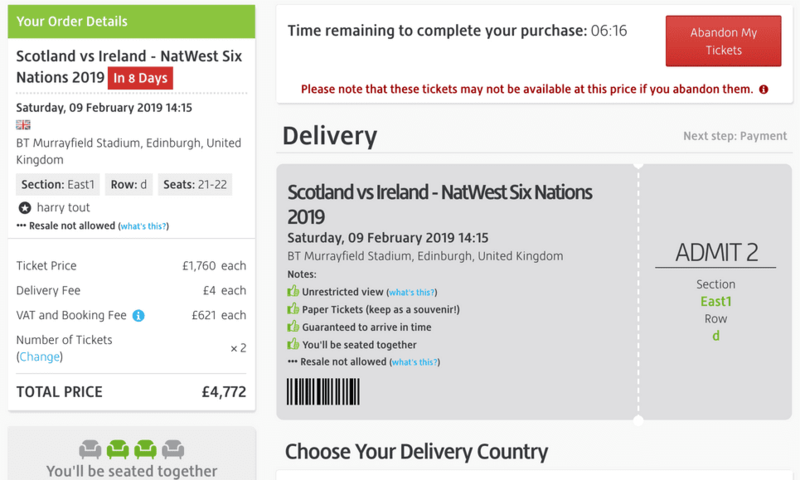 An investigation by the Guardian found Viagogo has been listing more than a thousand tickets for the Six Nations rugby competition worth more than £370,000 ($480,000/€421,000). The newspaper analysed 1,155 tickets that had a “Trader” label attached on the controversial ticketing site. It found they were being advertised for £369,526, including VAT, delivery costs and booking fees, collected by the website. The UK digital minister Margot James and the rugby governing bodies have criticised Viagogo and urged customers to stay clear of the resale site as tickets could be denied at the gate. The Guardian also noted that the exact number of tickets being touted is likely to be much higher due to the fact that the investigation only covered two days of listings. Of the 1,155 tickets examined, five traders controlled two thirds, with the majority in the hands of an individual trader under the name of Eileen Green. Viagogo is currently the subject of a court order by the Competition and Markets Authority (CMA) over alleged breaches of consumer law. Viagogo has responded to the investigation, stating in an email: “All tickets on Viagogo are valid and it is perfectly legal to resell a ticket or give it to someone else if you want to. Sellers set the prices, and the reality is that any tickets listed at silly prices rarely if ever sell. “Event organisers sometimes make claims that they will deny entry to people who have purchased resold tickets. These types of entry restrictions are highly unfair and in our view, unenforceable and illegal. Therefore, as with all tickets on our platform, Viagogo customers should feel confident that they will gain entry to the event, and that is why we back every ticket with the Viagogo guarantee. Following the passing of the court order deadline on January 17, the CMA said it has “serious concerns” that Viagogo has not complied with its court order and has threatened returning to court. Earlier this week, it was reported by the Daily Record that Viagogo has told potential customers that every ticket on its website is invalid in order to comply with the court. A spokesman for the Rugby Football Union (RFU) said the resale of tickets via secondary websites is prohibited by the RFU’s ticket terms and conditions. He added that ticket holders known to have breached the terms and conditions would be refused entry.